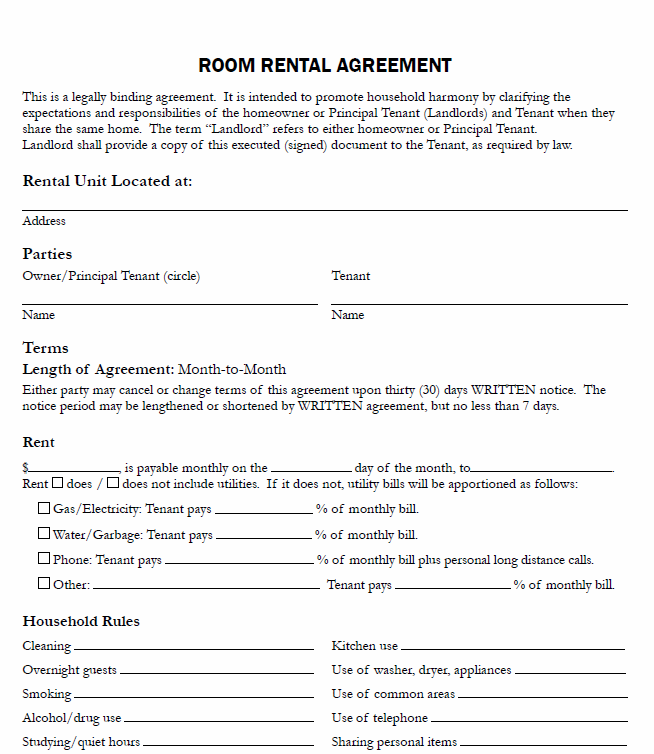 Room Rental Agreement is a generic template, it should be applicable in all states, but it is suggested to consult an attorney before you use this. It is an Agreement between the Landlord and the Tenant, when the Tenant is renting a room in the same premises where the Landlord Resides. This Legally binding agreement is to promote harmony between you the Tenant and the Homeowner or Principal Tenant. The Address of the room being rented, the names of 1) the Owner or Principal Tenant and you the Tenant. The amount of rent to be paid to the Landlord in US dollars and the Day of the month on which it is to be paid to the Owner. If the rent does not include payment for the utilities, then the bills will be apportioned in percentages that the tenants will pay to the owner. It contains utilities like; Gas/Electricity, Water/Garbage, Phone etc. Household Rules that have to be followed like rules related to cleaning, overnight parties, smoking, alcohol/drug use, studying/quiet hours, music/TV, pets, kitchen Use, use of washer, dryer, appliances, use of common areas, use of telephone, sharing personal items, bedroom assignment etc. A supplementary sheet will have to be attached detailing these points further or adding additional categories if needed. Amount of Security deposit to be paid and the date on which it has to be paid. Length of the agreement can be Month-to-Month, and either party can cancel or change its terms after 30 days written notice. Both you the tenant and the Landlord will try to resolve Conflicts that arise in an amicable and cooperative manner. Privacy: Reasons for which the Landlord can enter the Tenants room, and the written notice he has to give the tenant to enter during business hours. Disclosure related to Lead Based Paint if any. This document is validated after both The Landlord and The Tenant sign it. Click on the link below to download this form.